This week, we welcome CAPT Tom Farrell, MC, US Navy, Ret, as our guest blogger. Tom has been working on identifying the Navy Corpsmen present at the iconic flag raising on Mt Suribachi in the Pacific Theater during World War II. Herewith, Tom Farrell’s “say” in the matter. “Clifford Langley was not there.” James Bradley1, thus began my search for the identity of the second corpsman that accompanied John Bradley on 1st Lt. Schrier’s patrol to the summit of Mt Suribachi. February 23, 1945, LtCol Chandler Johnson Commanding Officer 2nd Battalion, 28th Marine Regiment after receiving a briefing from Captain Arthur Naylor that a patrol lead by SGT Sherman Watson, had successfully reached the summit of Suribachi, ordered 1st Lt. Harold Schrier to lead a 40 man patrol composed of elements of the Easy company Third Platoon and personnel from other 2nd Battalion elements up the mountain. After ascending to the summit, the patrol raised a small flag brought along on a pipe at 1030 hours. This was the first flag raised on that day and the event was photographed by Marine photographer Louis Lowery. The subsequent raising of the second, larger flag 2 hours later yielded the famous scene captured by AP photographer Joe Rosenthal. The fact that there were 2 flags raised and confusion as to whether Rosenthal “posed” his shot generated a debate. 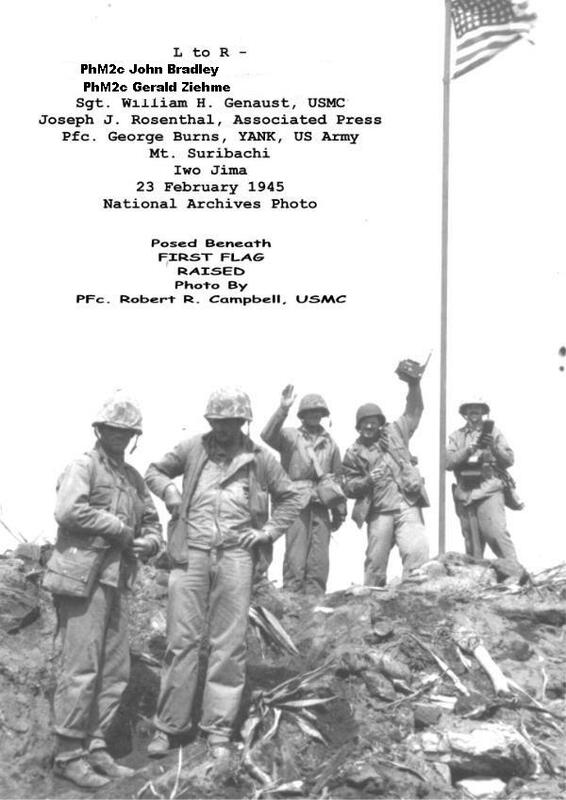 The first flag on Suribachi’s summit was an immense morale booster to the embattled Marines below. Its unfurling lead to loud cheering and signaling from the Navy ships offshore. The Rosenthal photo had a massive positive PR benefit to the Corps and as it was the centerpiece of the upcoming 7th War Bond Drive, Commandant Vandergrif ordered all mention of the first flag raising to cease. This directive lead to an institutional ossification during which individuals in the Lowery photos were routinely misidentified in the official Marine Corps records. My interest in the identity of the first flag raisers peaked after examination of the Lowery photo showed an extra set of hands and helmet in the photo not identified as to owner. Thanks to the kindness of COL Walt Ford2 at Leatherneck Magazine, I was able to obtain 14 of Lowery’s photos of the event. Using available sources, I tentatively identified all the individuals in the photos. I then sent them to Raymond Jacobs3 (patrol radioman “f” Co), Charles W. Lindberg 4 (“E” Co flame-thrower) and Keith Wells 5(XO “E” Co) asking them to confirm or change my initial identities. I now had eyewitness confirmation of true identities of the participants (see photo#1). It was now clear that individual identified as Schrier holding the flag pole was actually John Bradley! Two Navy corpsmen accompanied the patrol (plus stretcher bearers, number unknown.) The first, John Bradley PhM2c was assigned to 3rd Platoon “E” Company. The second assigned corpsman was Clifford Langley PhM2c but he was wounded on February 21, 1945 and was not part of the patrol. The identity of the second corpsman remained obscure until recently. John Bradley in an oral interview for the Naval Historical Center (www.history.navy.mil)6 recalled that he and “another corpsman by the name of Zimik (?) Pharmacist mate 2/c were the corpsmen attached to that patrol.” The publication of James Bradley’s Flags of our Fathers 7contained Rosenthal’s Gung Ho! photo. A debate over the identification of some of the individuals eventually led to the recognition of Gerald Ziehme PhM2c as a member of the patrol. His wife Judith told me that “Jerry said Bradley grabbed him and pulled him into the photo.”8 He had volunteered to go as “he had neither a wife or child” though assigned to headquarters from a replacement battalion. Three Marine Divisions (3rd, 4th, and 5th) took part in the Iwo Jima invasion (Operation Detachment). Integral to the divisions were 100 Navy Surgeons and approximately 1000 Navy corpsmen. Casualties to these medical elements were: Surgeons 23 (2 killed ) Corpsmen 827 (201 killed ) 9. The nature of the conflict to include large amounts of artillery led to an overall killed to wounded rate of 8% overall versus 3% for WWII in general. The corpsmen’s casualty rate exceeded even that of the Marines. Four corpsmen were awarded the Medal of Honor, two posthumously. John Bradley earned the Navy Cross on February 21, 1945 for conspicuous bravery attending to a gravely wounded Marine while under intense enemy fire. Typical of WWII veterans, the two corpsmen went on with their lives not discussing their experiences. Bradley did participate in the 7th bond tour, the dedication of the Marine Memorial and played himself in The Sands of Iwo Jima but otherwise resisted attempts at interviews and it was only after his death that his son learned through saved memorabilia of his father’s accomplishments. In fact James Bradley was unaware that it was his father misidentified as Schrier in the Lowery photograph until we showed him the other Lowery photographs. Ziehme did not seek public recognition until he was labeled an “imposter” after his attempts to correct the Gung Ho! photograph identities. His reaction was to hire a lawyer and a forensic photographic expert to confirm his presence in the Gung Ho! Photograph 10. His wife Judith also told me that Jerry and John Bradley would often run into each other awaiting care at the Veterans Administration Hospital and remained friends. I invite your attention to the following materials.